Vintage One: 20 years of Mtn Bike passion and counting. : Damn the grams. 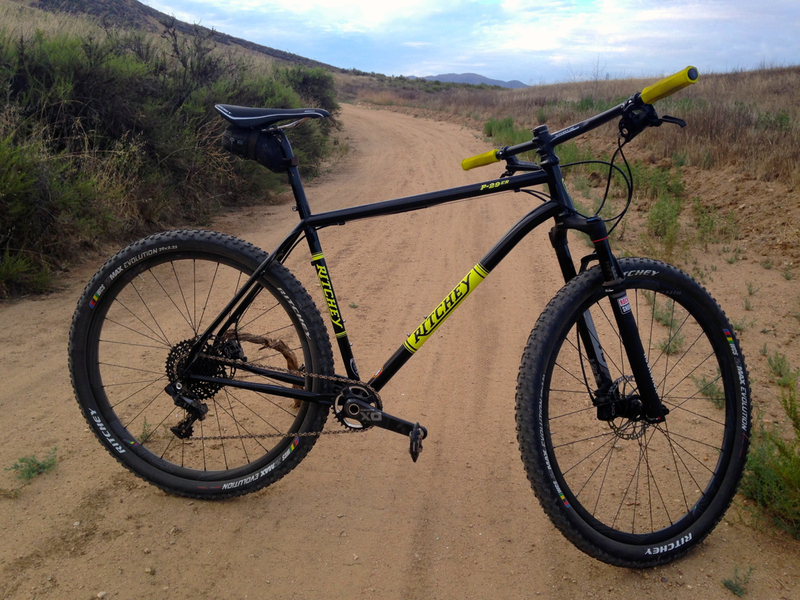 My first 29er was a Karate Monkey, which began geared and then, as I acquired another FS 29, was converted to SS use. I never really loved that bike. It felt kind of harsh and skittish in rough sections and weighed a ton. The next SS was a Vassago Jabberwocky. Despite flaws of its own, and despite the same piggy weight, I loved that bike. Just loved it. I have this distant memory of how it used to feel on the faster crappy trails and fireroads like are so common around So Cal. I could almost recall the way it moved down the trail in a springy yet solid way but it had been so long and there had been so many other bikes in the mix since then, that I could not remember for certain...like a faint odor that lingers in the air, prodding an even fainter memory. Each new SS had been lighter and 'faster', first in aluminum, then carbon. Each one gave me a great ride uphill and was exciting to pedal hard, but something else was happening. Something was being lost in the trade and it happened so gradually that I did not notice. Each bike was less and less fun to ride, unless I defined fun as how quickly I went uphill. Strava was pleased. Myself, less so. But it is hard to go backwards when that means adding grams to the bike you are riding now, or replacing it with a different bike that will be heavier. The weight weenie within must have its say in the matter. So the newest carbon SS 29er, which actually is a very nice riding bike for its ilk, hung on the hook, languishing, and I wondered if things could be different. But yesterday I unboxed a test bike that I was very curious about, in fact I was darn near excited about it. But with a recent disappointment with another bike I thought for sure would ring loud and clear and speak to my soul but only murmured, I was thinking I might be delusional about this one too. I was unwrapping something I had not straddled for years now, and as the bubble wrap and blue painters tape fell away, I saw thin steel tubes coated in black like Johnny Cash on Sunday. Steel. It looks so odd in a world of hydroformed aluminum and oversized carbon. So the thing is this...is there really something great about a refined steel frame that seems to transcend other materials in an almost undefinable way? It sure isn't about having a light bike. This one was built with very good parts yet weighed what one of my FS alu 29ers (with VERY NICE parts) weighs. And pedaling out to the trail was just OK. Nothing magical. The first steep hill was so so and it sure did not scream KOM like the last carbon wonder bike I rode. But that carbon winged Pegasus was also nothing I wanted to toss a leg over and trail ride all day either. Fast? Oh my yes. You pedal, it answered. But unless you were hell bent on collecting Strava Bling, then it just was not fun IMO. And although suffering and speed and performance are all part of the ride experience, let's not kid ourselves. It needs to be fun. I hit the top of the climb last night, said hello to 'Da Boyz' that were up there, and dropped in on a quick little ribbon of trail that quickly becomes like a luge run with baby head rocks melting out of the ice. Within 100', that memory came back like a smack in the face, like that faint odor you could not place just became a warm from the oven chocolate chip cookie melting on your tongue and you said "that's it!" That supple, lithe, springy goodness of steel doing its thing just rose up and I remembered. And it was just like that all the way down the trail. I was boosting off of the bigger rocks and dancing through the ruts with a fine mix of precision and give that was just so fun I was grinning all over. SO IT'S TRUE! I was not wrong and I had not imagined it. And I missed it terribly. So everything is a give and take. But I do wonder if, along the path chasing the better and the best and the stiffest and the fastest, that were given so much we did not notice what was taken away?